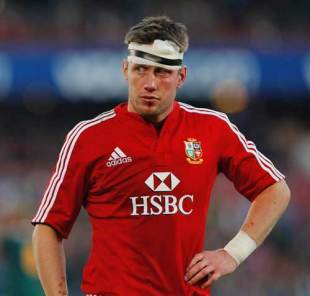 Lions fly-half Ronan O'Gara has described how he was knocked out during the crucial second Test defeat to South Africa in Pretoria. The Munster and Ireland stalwart, who was widely criticised for his cameo role in the Lions' series-deciding 28-25 defeat at Loftus Versfeld, was knocked out whilst tackling Springboks No.8 Pierre Spies. Moments later he missed a tackle on centre Jacque Fourie as he crossed for a crucial try and would then opt for garryowen in the dying seconds of the game that would eventually lead to Morne Steyn's match-winning penalty. O'Gara, speaking in his first interview since returning home with the elite tourists, insists he would take the same option again and try to win the match rather than play for the draw. "I got knocked out (by Spies) and I tried to get back into the defensive line and missed a tackle," O'Gara told the Irish Times. "I was knocked out and didn't really know what I was doing. I just remember trying to throw myself at Fourie and I couldn't see him properly, you know. So I missed him." O'Gara, who was over-looked for the Lions' famous No.10 jersey in favour of Welsh rival Stephen Jones, was also unrepentant regarding his tactical decision in the closing moments of the tour-defining match. "That (decision) doesn't cost me a second thought because I'd do the exact same tomorrow," said O'Gara. "People ask me would you not kick it out but it never entered my head to kick the ball out. I couldn't see what a draw would do for anyone." The 32-year-old also spoke of his deep disappointment at being left out of the first-Test starting team despite some eye-catching form in the warm-up clashes. "I was sitting in the meeting fully expecting to be selected. I thought I was in poll position. When it was announced it was a big blow," he told the newspaper. "I did expect to come on at half-time in the first Test but that didn't happen. With 15 minutes to go it didn't happen. I was saying I'm seeing this game differently from everybody else. "Maybe this management had their minds made up that they wanted Stephen. I just got back to my room and thought I don't think I'm in with a shout here."